* Return airfares & taxes flying Thai Airways International, a full service airline. Your airfare includes a 20kg luggage allowance, meals, drinks and in-flight entertainment. Advertised price valid for travel 1 May - 30 Sep 19 subject to availability and black-out dates may apply within this date range. 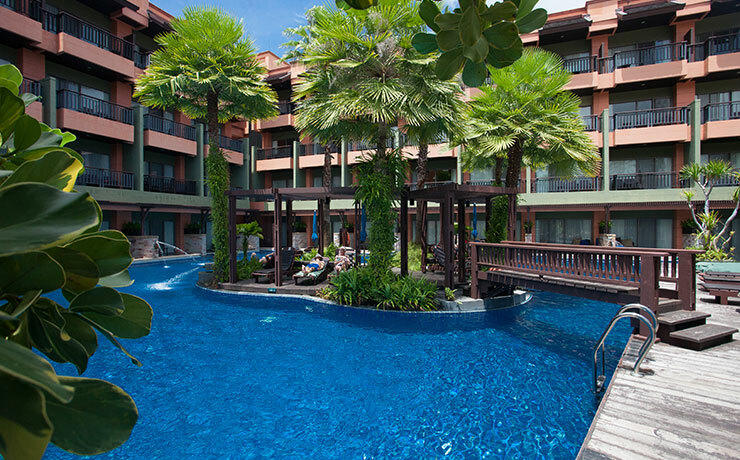 The Patong Merlin Hotel is an international holiday resort in the heart of Phuket's exotic Patong Beach. This popular resort has 6 low-rise buildings nestled in 8 acres of coconut palms and flowering gardens, surrounding a centerpiece of three beautiful sculptured aquamarine swimming pools. The recent addition of a new wing has brought a new level of style and value to accommodation in Patong. The new wing is built around its own pool, which can be used only by guests in this wing, offers Deluxe Pool View rooms on the upper floors and the very popular Direct Pool Access rooms on the pool level floor. The rooms are very spacious and are more contemporary in design with elegant bathrooms and spacious balcony or terrace. The rooms in the original resort are categorised into Non Pool view or Pool View. Each is the same design and decor and offers a spacious well maintained room with every amenity for a great stay including a great balcony with either a view of the gardens or over the beautiful pools. For the little extra cost the upgrade to pool view rooms is recommended. In addition to presenting excellent rooms the resort also offers a variety of dining options including an International Coffee Shop for breakfast, lunch and dinner or the popular Cafe Del Mar for a quick snack. For a refreshing drink there is the Lobby Bar or Sunset Bar and of course you can get whatever you need by the pool. 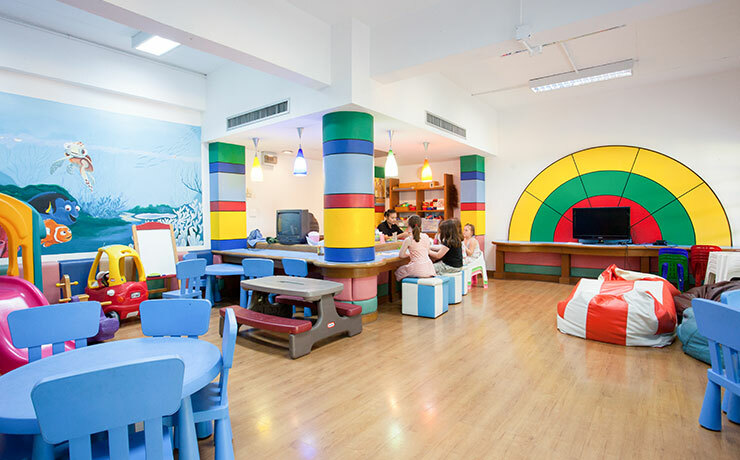 Other activities include the Spa, Fitness Centre or the Internet Corner. The Patong Merlin Hotel is one of Phuket's most popular resorts due to its great location with Patong Beach immediately across the road and the street markets and main restaurants, bars and entertainment areas are just a short walk from your doorstep and its wonderful relaxed holiday atmosphere. 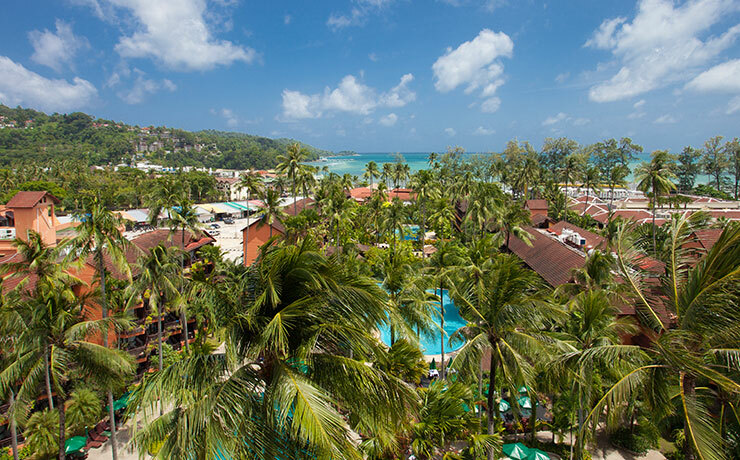 Located at the heart of Patong Beach, set in 8 acres of coconut garden, Patong Merlin Hotel is just 43 km, approximately 45 minutes, drive away from Phuket International Airport. The hotel is in close proximity to everything in Patong the beach, restaurants, pharmacy, shops and bars, everything is really just a walk from your doorstep. Phuket Town city centre is just 17 km away and is very accessible via several modes of transportation available in the area. 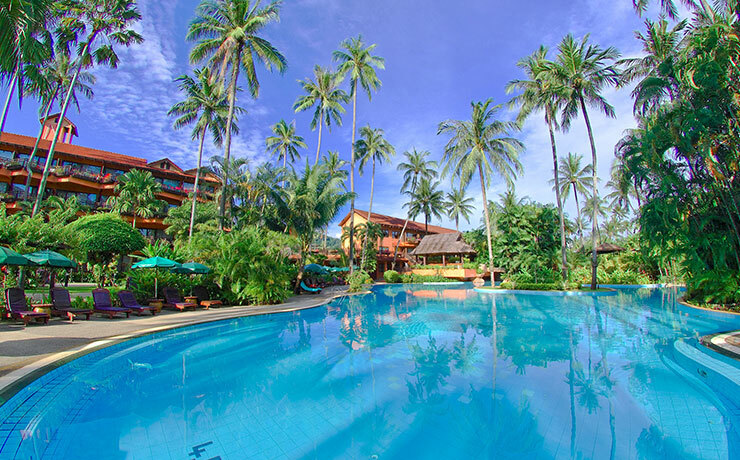 Patong Merlin offers all the facilities of an International Resort including superb dining options, tour desk, fully equipped gymnasium, and spa. Guests can access a full range of water sports at the beach immediately across the road. Sun-bathing decks are scattered around all three swimming pools where the guests can laze while having some cool drinks or light snacks. Dine at the open air Cafe Del Mar with panoramic view of the Patong Beach while enjoying a LAVAZZA Italian coffee, or enjoy a delicious barbeque buffet. Enjoy, unwind and relax by experiencing an authentic Thai Massage or by visiting our Spa where you can rejuvenate and recharge yourself. The Merlin Spa uses natural products prepared by well-trained staff who will soothe your jangling nerves and leave you feeling fresh and relaxed. Keep in touch with family and friends or surf the high speed internet while enjoying your favourite drinks at the Internet Cafe. For peace of mind there is even an on site clinic open daily from 10.00am to 5.00pm. This charming property has long been a favourite in Phuket to the Australian traveller and with a games room and Kid's club it makes a perfect choice for families. Patong Merlin Hotel serves the world's finest cuisines in a variety of indoor and outdoor eateries with a variety of menus to choose from, we have Thai, French, Chinese, Italian & German menu which will surely match your taste. There are air-conditioned five-star restaurants, cafes in the sun, bars on the beach and lounges by the pools. Not to mention the sumptuous BBQ's on the Terrace and themed buffets under the stars. Themed daily buffet dinners are served daily from 7:00pm to 11:00pm at the open air Seaside Theme Night Terrace. 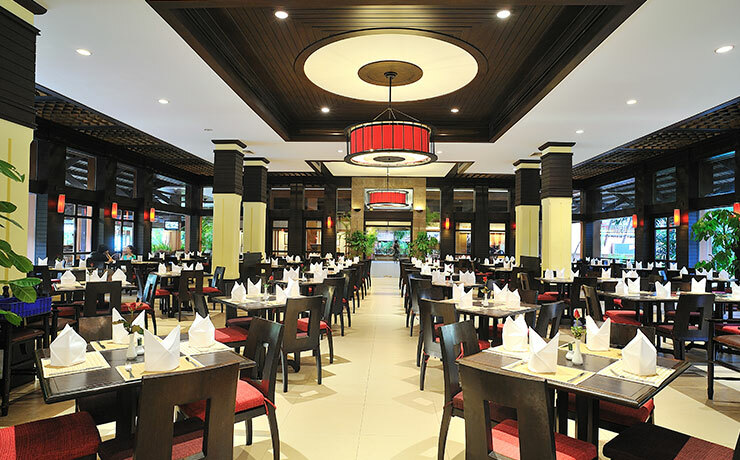 Satisfy your taste buds, eat your heart out and try the sumptuous cuisines offered at Patong Merlin Resort. The resort has a total of 379 tastefully decorated and well-equipped standard rooms, many with pool views. All guestrooms provide a balcony, air-conditioning and bathrooms, colored TV with satellite channel, IDD international calls, mini bar, tea/coffee making facilities, in-room safe, umbrella, and hairdryer Perfect for those travelling with children: some rooms configured with a king bed and a full size single bed. The rooms are delicately designed to give comfort and relaxation plus our ever smiling and attentive staff will surely make your stay a remarkable one. Standard rooms are 36sqm in size. Bathrooms feature either Bath/shower combined or shower only. These rooms are great for families as they are spacious while still offering a full size single bed as well as the king bed. Superior Pool View rooms are the same as the Standard rooms in size and features the difference is the room enjoys views of the Pool. Deluxe Pool View Rooms are the resorts newest edition. Located on the second floor of a purpose built wing, these rooms will surround a pool which will be only accessible to the guests of the Deluxe Pool View Rooms and Pool Access Rooms offering more privacy to the guests. Pool Access Rooms are located on the ground floor in the same building as the Deluxe Pool View rooms. Rooms will have direct access to the pool, and are suited to couples the style and design of the room will not allow children 12 years and under to be accommodated in them. We offer two (2) rooms at a reduced rate for families of 2 adults and up to 3 children. The Bonus free night offers are also applicable to this special. Room assigned will be 1 room with a king bed and 1 rooms with 2 singles (plus rollaway for additional child). Guaranteed interconnecting rooms. Kids between 5 to 12 years are free to come and join the Kids Club making this a popular choice for families. Open 8:00am to 12:00pm and 1:00pm to 5:00pm the club offers activities including making pictures with wool, drawing, funny sand activities, balloon marking, making pictures with dried and fresh flowers, mask making or playing jigsaw. Children between 5 and 12 years old are free to come and join us by themselves. Children under the age of five years old must be accompanied by a parent or a baby sitter. Baby sitting service is available. An uncovered outdoor play area is adjacent to the kids club. Registration time: 08:30 am - 10:00 am for morning session and 1:00 pm - 2:00 pm for afternoon session. Free of charge. Advertised price not valid during school holidays, Christmas and New Year. Contact a Holiday Champion for prices over these periods. Prices shown are a guide only, please contact one of our Holiday Champions for an exact quote on the dates you wish to travel & any conditions that may apply. Prices are per person and include airfares, all taxes, transfers and twin share accommodation. Seasonal surcharges can apply especially during school holidays. Hotel specials have varied travel dates, block-out dates & high season surcharges may apply. Prices are also subject to change without notice due to currency, tax fluctuations & fuel surcharges.